Well finally got Mojo in the school to do some pole work and short lining. We haven’t managed much recently apart from grooming and a little targeting on the yard. 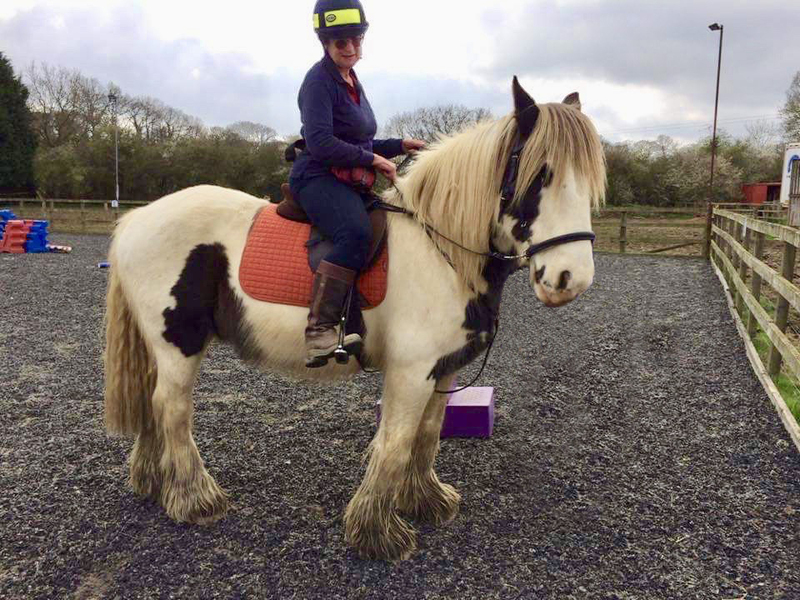 I used my new short lines from Whinny Reins – they were brilliant, very easy to hold and didn’t get all tangled up like the feather lines, I must take a photo next time. Anyway Mojo was very good, he walked well over the poles from a “walk on” cue and stopped on a “whoa”. He went to the frisbee I threw for him and even had a little trot, must now get the trot on a reliable cue. Only did a few minutes and now must build it up so we do more and then some ridden sessions. Due to cataract surgery I haven’t done anything with Mojo – apart from pulling some twigs out of his mane. Today he was in for a rest from the wet fields, with a big pile of hay in his hay bar. He popped his head over the door and looked at me out of the corner of his eye. That is probably due to his unruly forelock blocking vision. I went in his stable and groomed him – well the bits that were dry, then put on my treat bag and loaded it with grass pellets. We went out into the yard and I groomed him a bit more, pulled the twigs out of his tail, sprayed it with “Mud Away” – not sure it does any good but we will see. He had a few pellets to nibble on in a bowl whilst I tidied up his tail and mane – scissors and a solo comb. I got the frisbee I use as a target and did his stretching exercises. He stood quietly whilst I switched on the small trimmers and just walked around the yard. We then did some targeting of an umbrella – just to make sure he hasn’t forgotten anything. It is amazing with these horses that even after doing nothing but being a horse in a field for nearly 2 months he was still enjoying touching a moving umbrella. My plan in the next few weeks is to get him happy to go in the lorry and be driven around the block. Mojo had a flu booster today, all was good the vet was superb, she hugged him and as he was wondering what she was doing the injection was done and he never even flinched. Plenty of treats followed. Before the vet arrived I groomed him and did some stretching exercising with the target. Also I had the trimmers on and walked all round him, he even let me touch him with the back of my hand whilst the holding the trimmers which were on. The battery is dying so it wasn’t very loud but a few weeks ago he would had have just left. Well we only managed one session of training last week, but Mojo was much calmer at the top of the arena. I used the cones to settle him and get his attention away from the mirrors and scary pigeon producing hedge. He was very good at his cone touching and then he stood at the mounting block and turned his head rather moving backwards for the reinforcement. We did the mounting block at the top, middle and bottom of the school. Here is a little montage of the session at the lower end of the school. 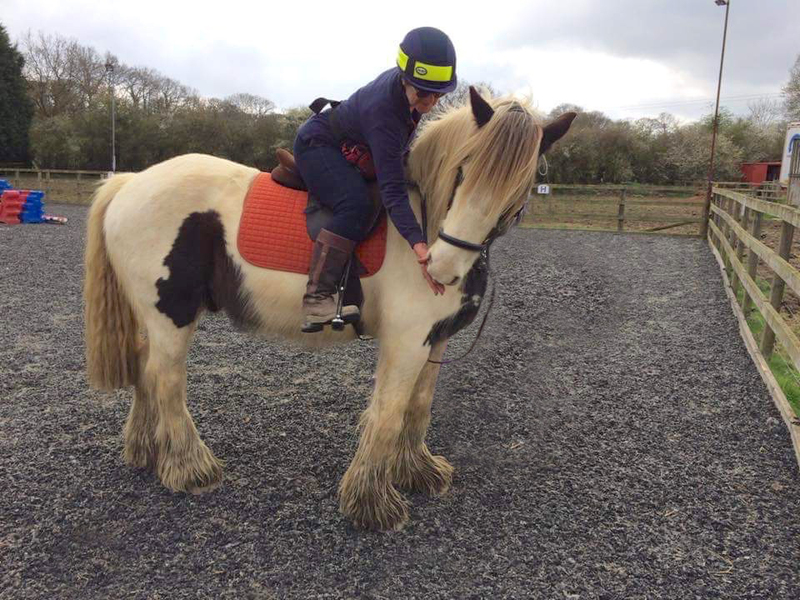 Another lesson with Sally Ede on Friday 17th so hope all goes well. I saddled Mojo for the first time this year, he was very good. He was in the school loose so had the opportuntiy to leave if he felt he needed to do so. We then walked around a bit before the bridle was presented, he stuck his nose in and stood whilst I fastened the buckles. Mojo sidled up to the mounting block as soon as I stood on it and allowed me to get on. With a little moral support from a friend I asked him to “walk on” which he did and we got half a circuit of the school no leg pressure or rein contact. Below are the photos my daughter took on her moble phone – as I left my camera in my car. Mojo being a very good boy. I am studying to be an equine behaviourist but so far am unsure whether I want to practice as a behaviourist. The equine part of the equation seems to be the easiest component. Changing peoples long held believes is very difficult, so many don’t even understand the basics of how animals learn. I don’t blame the average horse owner as they are not taught this at riding schools or even in colleges at diploma level. If people are using pressure to motivate horses they need to understand that it is the relief of that pressure that reinforces the behaviour. This is basic negative reinforcement but I did not learn about this from the British Horse Society or even when I was doing natural horsemanship. I did learn that it is the release that teaches the behaviour but not that it was the use of an aversive stimulus nor was negative reinforcement ever mentioned. It was only when I investigated clicker training that I learned about positive and negative reinforcement. The more I learned the more convinced I was that positive reinforcement is better for the emotional health of the horse, it gives them a choice. They can say “no” instead of being too afraid to object due to the adverse consequences of non-compliance. Even when I was doing natural horsemanship the horse was not allowed to walk away as this was seen as being “disrespectful”. Benny taught me so much – he was very adept at escaping the escalating aversives and he introduced me to positive reinforcement. Mojo is teaching me even more, horses can teach us so much, if we listen, than any human can. We do not need to subscribe to any particular genre of horsemanship, we need to learn as much as we can from as many sources as possible. Only then can we truly decide what is in the best interest of the horse. To be blinkered or brainwashed by clever marketing is very limiting but unfortunately very common. So I do find the human animal very hard to understand – it is the human who has to change if the horse is to have a better life.